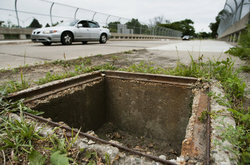 Posted on Mon, Mar 12, 2012 : 5:36 p.m.
Several sewer grates were stolen overnight Friday from Mid-Tech Inc. in Scio Township, police said — the second such theft there since the end of February. Scrap metal theft is a problem in Washtenaw County, police say. The theft continues the trend of sewer grates and other metal objects being stolen to be sold as scrap. Scrap metal thefts have become a major problem across Washtenaw County, according to police. Mid-Tech Inc. is located at 175 Dino Drive in Scio Township. The sewer grates were discovered missing on Saturday morning when an employee showed up to open the business, according to police. The Washtenaw County Sheriff’s Office is investigating the incident, and police have no suspects at this point. This is the second theft from the business since the end of February. Employees reported on Feb. 27 that an unknown amount of scrap metal had been taken from the business some time during the weekend. That case also is under investigation. People do in fact have scrap laying around that could be old grates. Most people that bring in scarp do it in truckloads, it is almost impossible for scrap yard owners to check each item that comes in. That does not mean they should be taking new copper pipe or rolls of wire that look new. As Mid-Tech is a metal fab company I would hope that they could figure out how to mount a frame in the cement and hinge a new grate with theft-proof hinges/clasps. Tue, Mar 13, 2012 : 1:02 p.m. Enough is enough. Time to install GPS tracking devices on all sewer grates. Sounds like the deputies need to patrol more and stop sitting in the station. I see patrol cars parked all the time. Mon, Mar 12, 2012 : 10:42 p.m.
Time to agressivly prosecute the places they take the scrap to and sell it. That will stop the problem pretty quickly! Obviously if you come in with a pile of sewer grates it is not stuff you had &quot;laying around&quot; your property! Tue, Mar 13, 2012 : 12:16 a.m.
Maybe they were trying to increase their Recyclebank points in their home recycling?